An exotic, custom treatment wins awards for a Miami Trim Shop. Clint's Custom Trim Shop. features in Auto Trim & Restyling News in July 1989, has recently been the recipient of the World of Wheels Outstanding Interior Award at the 1990 World of Wheels Custom Car Show held in Miami. 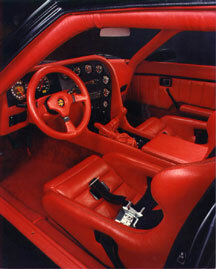 A one-of-a-kind interior was redesigned for a Mazda RX7 GTO. "You know you've reached your goal, your top level, when you've built an interior and everone thinks it came from the factory like that." Clint McVicker, owner, tells us, "Upon arrival at our location the Mazda's interior was completely gutted. 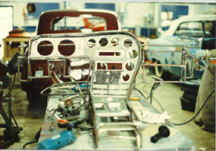 The dash and console were first designed, engineered and handcrafted in steel. The interior was all hand crossed stitched in black on red leather. It was completely hand-built with extensive machine work throughout. Red Wilton wool carpet, a full competition roll cage custom fitted throughout the vehicle, full custom gauges, a MOMO steering wheel covered in red leather and hand stitched and Koning racing seats also covered in red leather and hand stitched completed the job." After winning the award at the Miami show McVicker was told by the judges the, "You know you've reached your goal, your top level, when you've built an interior and everyone thinks it came from the factory like that." McVicker was a self-taught upholsterer who takes his business very seriously. The shop does not do fast, high production work that borders on the slipshod. Each customer's needs are important to them. His work has been featured in many magazines and he has done quite a few jobs for Miami Vice's Don Johnson.